Indulge in an afternoon snack fit for a queen. Bring together elements of Sardinian cuisine with crunchy Carasau bread and Sardinian Pecorino cheese, merging them with Veroni full-bodied mortadella and the tang of seasoned artichoke hearts. 1. Clean the artichokes well by removing the hardest leaves until you the softer center remains. 2. Slice the artichoke hearts finely and season with oil, lemon, salt, pepper and chives. 3. Slice both the pecorino cheese and the mortadella to the approximate size of the sliced artichokes. 4. 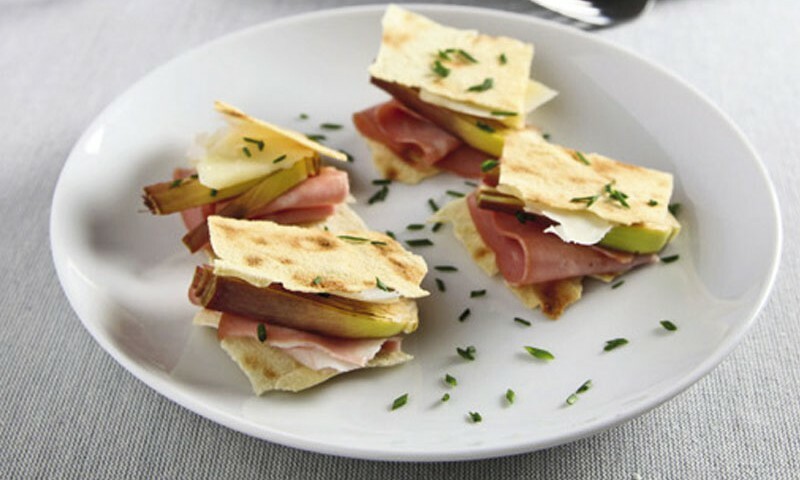 Create the millefeuille by alternating the sheets of Carasau bread with the chopped mortadella, the artichoke slices and the sliced pecorino cheese. 5. Drizzle with extra virgin olive oil and chives.